Hello and happy Sunday! I’d like you to meet Dana from Crafty Minx. 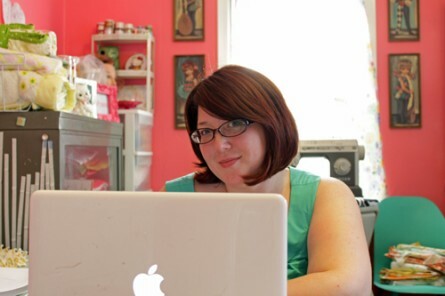 She’s a sweet and colorful lady with lots to share on her blog. She has great tutorials and tips, so be sure to check out her blog after this. I have to say that I’m very impressed and inspired by Dana’s studio. The first thing that caught my eye, obviously, was the color of the walls paired with pops of color here and there. I could get lost in her studio for days and still not lack in things to do. 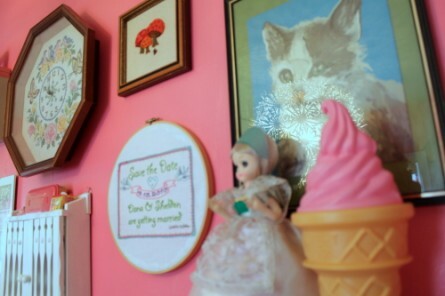 I love the “kitschy” feel of her space and she has really made it her own. On that note, let’s get to know her a bit better and peek into her studio space. 1. Who are you and what do you create/do? I’m Dana Beach from craftyminx.com. As my name suggests, I flirt with a lot of crafts. I knit, crochet, embroider, scrapbook, paint, spin, sew, and occasionally quilt. I am currently working on a 365 project where I crochet a granny square a day. My studio is in my house, it used to be the laundry room, but was converted to an art/music studio by previous owners so it just seemed logical that I use the space for a studio as well. 3. How long have you had your current studio space? For 5 years. It has gone through quite the transformation since I first moved in. 4. What is your favorite part of your studio? 5. Approximately how many hours per day do you spend in your studio? 1-3 when I’m doing work that requires a desk, but most of the time I work in the living room because it’s more comfortable for crochet and embroidery. 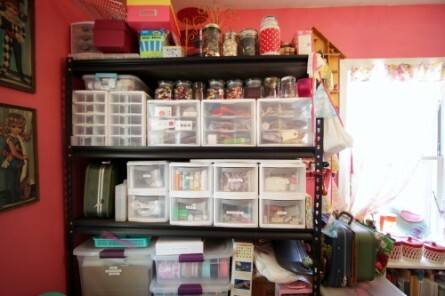 At times like that the room is a great, inspiring storage space, which I need because many crafts requires many supplies and a place to store them. Right now I’m pretty happy with it. 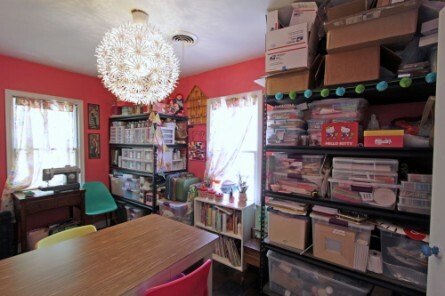 I just did a big revamp last year (you can see a before and after pic here: http://www.flickr.com/photos/craftyminx/4396307169/ I would like to buy a new house in the next five years or so and build a bigger detached studio. 7. Is there anything else that you’d like to share? I told you it was a great and vibrant place! Thank you so much, Dana, for letting us peek into your lovely space, I loved it! You have a great space and you should be very proud of it! 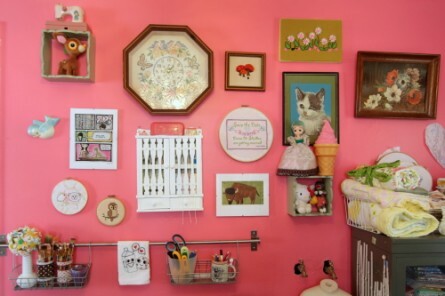 And I love the pink walls too!